A report recently came out showing that Android is really stepping up with the 'big boys'. 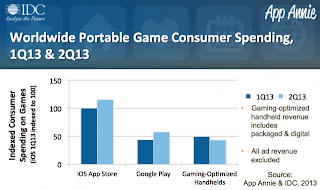 The IDC reports on spending for mobile platforms and the latest report shows that, although spending overall is down, Google Play has come in second, beating "gaming optimized handhelds". Now, here's where we get out our NaCl (that's my euphamism for saying to take this report with a grain of salt... get it?). iOS is still king, nearly double what Android's turning out. 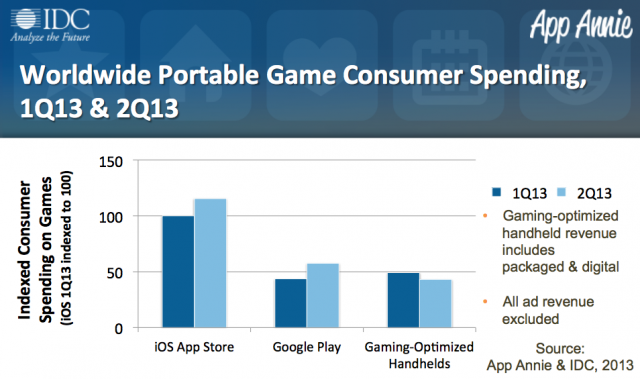 Android is just eking out over the handhelds by a small margin, and that's in an area that's decreasing. Which stands to reason, the way I figure it is like how my wife and I discussed this past Christmas for my son. There was no way I was going to spend $100-200 on some LeapFrog or other 'learning' or kid tablet, when for a few dollars more I can get him a 'full blown' tablet. My thinking is that most people are reasoning the same when it comes to a game system. A 3DS is going for $200 right now. It's 4.88" @ 400x240 pixels. Gets you about 3-4 hours of play time. For a few dollars more you get the new Nexus 7 with full HD. 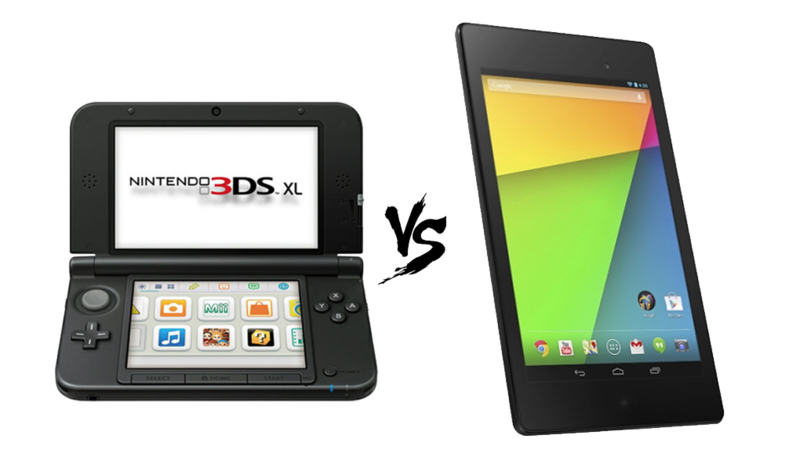 Sure it doesn't have the screen controls like a gaming device (but you can get peripherals, if that's your thing). It doesn't have some of the titles like you might want (no Mario = dealbreaker for my 5 year old). But it has a crapload more games to get, plus you're not locked into that ecosystem, forcing yourself to update your game library when a newer generation comes along.